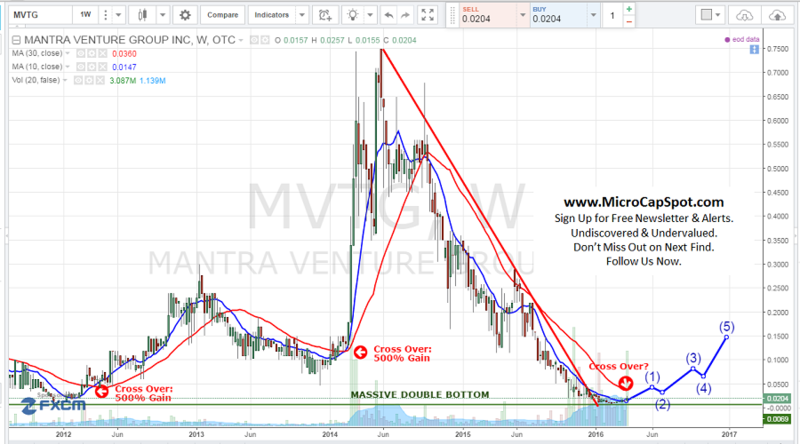 Mantra Venture Group Ltd (OTCMKTS:MVTG) is set to triple from current levels after recent developments and the large volume expansion achieved through out the last few trading days. Trading volume hit an all-time record high a few days back with over 2 million shares exchanging hands and has continued to keep up the pace. Volume has exceeded its daily average volume over the last several days. MVTG is a clean technology incubator that takes innovative emerging technologies and moves them towards commercialization. Through its subsidiary Mantra Energy Alternatives it is developing two groundbreaking electrochemical technologies designed to make reducing greenhouse gas emissions profitable. The first technology is ERC which is a form of “carbon capture and utilization” (CCU) that converts the polluting greenhouse gas carbon dioxide into useful, valuable products including formic acid and formate salts. By utilizing clean electricity, the process offers the potential for an industrial plant to reduce emissions while generating a salable product and a profit. According to a recent filing, the company stated in order to fully carry out its business plan, it needs additional financing of approximately $4,600,000 for the next 12 months. In order to improve our liquidity, it intends to pursue additional equity financing from private placement sales of equity securities or shareholders’ loans. Issuances of additional shares will result in dilution to our existing shareholders. It currently does not have any arrangements in place for the completion of any further private placement financings and there is no assurance that we will be successful in completing any further private placement financings. If we are unable to achieve the necessary additional financing, then they plan to reduce the amounts that it spends on business activities and administrative expenses in order to be within the amount of capital resources that are available to them. MVTG is currently trading at a $3 million market valuation. The company has announced that it will be merging with Novomic and changing its name to represent its new business. MVTG will essentially cease to exists as it does today. This is very akin to a reverse merger and should be beneficial to shareholders once they establish a business strategy. We will be updating on MVTG when more details emerge so make sure you are subscribed to Microcapspot so you know what’s going on with MVTG. Disclosure: we hold no position in MVTG either long or short at the publication of this article.